Notes: The first FOE monolith. Presented to the Chicago Park District at the 1954 Grand Aerie Convention. Not known if it was ever dedicated or placed on public property in the City of Chicago. Of particular note about the monument: (1) the tablet in the upper left includes Roman numerals I-III (representing the three religious commandments) and the tablet in the upper right includes Roman numerals IV-X (representing the seven secular commandments), (2) the commandments are numbered with Roman numerals with the “coveting commandment” shown as commandments 9 and 10 and (3) there is no “graven images” commandment – each consistent with the Catholic version of the Ten Commandments. These attributes should not be surprising inasmuch as Judge E. J. Ruegemer – who as chairman of the Eagles Youth Guidance Commission founded the Eagles Ten Commandments program – was a devout Catholic. Location: Chicago Heights Park District office at 1400 Chicago Road. Notes: The Anno Domini in the scroll is unique. 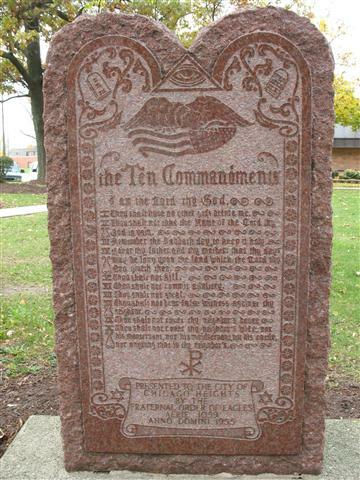 Location: Lawrence County Courthouse, facing State St. near 11th St.
Notes: Hebrew in the two tablets at the top is unique among the FOE monuments. Current Location: Waukegan Police Department, N. Martin Luther King Jr. Ave. between Washington and W. Clayton Streets. Original Location: Jane Dowst Memorial Emergency Hospital that had closed and was being used by the Police Department. The building was torn down to make room for the new Waukegan City Hall.